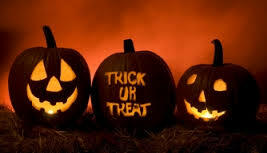 Florida Real Estate: Halloween Safety Tips! 1. Always cross the street at corners, using traffic signals and crosswalks. 2. Make sure to look left, right and left again when crossing and keep looking as you cross. 3. Put all electronic devices down and keep heads up and walk, don’t run, across the street. 4. Please teach children to make eye contact with drivers before crossing in front of them. 6. Do not forget to watch for cars that are turning or backing up. Teach children to never dart out into the street or cross between parked cars. 7. Children under the age of 12 should not be alone at night without adult supervision. If kids are mature enough to be out without supervision, they should stick to familiar areas that are well lit and trick-or-treat in groups. 8. Decorate costumes and bags with reflective tape or stickers and, if possible, choose light colors. 9. Choose face paint and makeup whenever possible instead of masks, which can obstruct a child’s vision. 10. Have kids carry glow sticks or flashlights to help them see and be seen by drivers. 11. When selecting a costume, make sure it is the right size to prevent trips and falls.